that gets up and goes. Visitors to Opoutere are always quick to comment on our wonderful birdlife. We are lucky to share Opoutere with the tui, kereru, bellbird, piwakawaka, wax eye, kaka, morepork, cormorant, oystercatcher and of course, the dotterel. The Wharekawa Spit hosts a gazetted wildlife sanctuary where an amazing array of birds make their nests each summer, most notable are the dotterels and oystercatchers (endangered and threatened birds respectively). Click here to read a comprehensive report about our amazing Opoutere birdlife written by esteemed shorebird ecologist Dr John Dowding, BSc (Hons) MSc PhD. The Department of Conservation send out an officer each year who works cooperatively with the community to manage this precious environment. In addition to this Dotterel Watch is a community program that stations volunteers at the edge of the nesting area at low tide to prevent members of the public from disturbing the birds. If you find an injured or distressed bird call Gaye Butcher at Mill Creek Bird Park in Whitianga, 07 8660166, click here for a comprehensive list of bird rescue centres. We share this special place with an endangered species – the NZ Dotterel. ORRA has a strong interest in protecting and nurturing back from the brink of extinction, this sandspit neighbour. The Opoutere beach and sandspit is one of the few remaining habitats of the Dotterel. The location provides many of the requisites they look for in a home: long beaches and shallow, sandy estuaries rich in food, where they lay two to three olive-brown eggs in shallow scrapes. Unfortunately, desirable Dotterel real estate is also what people find attractive. Their decline is partly due to their approachable nature, making them vulnerable to people and predators. NZ Dotterels can be hard to see, because their colouring merges effectively with the background of sand, shells and dune vegetation of their environment. Their distinctive ‘chip-chip’ call is often heard before the birds are seen. New Zealand Dotterels are endemic to New Zealand, (only found in the wild here). Their numbers have been severely reduced. Like Kokako, Kiwi and Yellow-eyed Penguins special protected habitats are necessary if these NZ treasures are to survive. Internationally, the term Plover is used interchangeably with Dotterel which is also commonly spelled Dotterell. Called “tuturiwhatu pukunui” in te Reo, they have the Latin name “Charadrius obscurus”. There are two types of New Zealand dotterel – Northern and Southern. The Southern New Zealand Dotterel (C.o.obscurus)is only found on Stewart Island. It nests on the ground on mountain tops. Even more endangered than its Northern cousin, there are only about 60 Southern New Zealand Dotterels left. The Northern NZ Dotterel (C.o.aquilonius) are found around the coast in the Waikato, Auckland and Northland regions. In the year 2008 there were only about 1700 Northern NZ Dotterels. 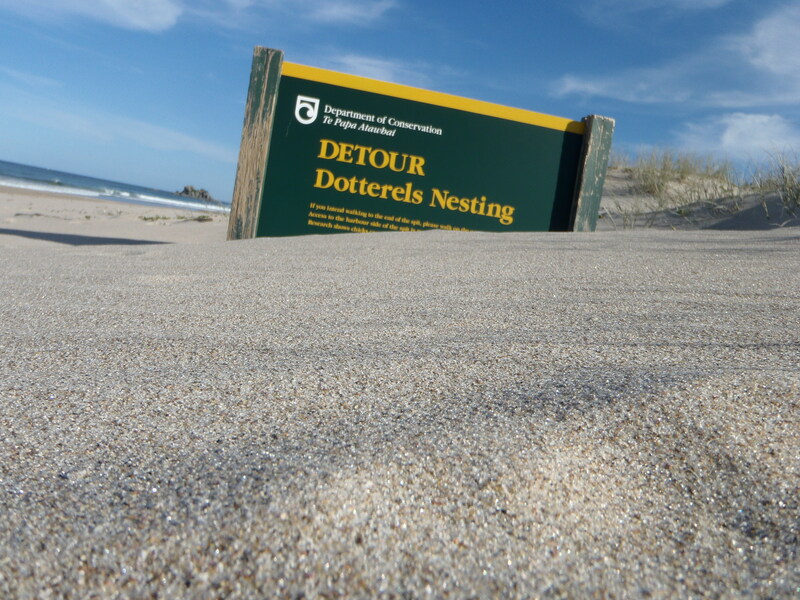 Northern NZ Dotterel nest on beaches above the high tide mark. Their nests are not made of twigs and moss like nests in trees, but are shallow scrapes in the sand. Parent birds weigh about 145 grams and measure about 25 centimetres. They lay eggs in the spring and summer, between October and early January. Chicks hatch 28 days after the eggs have been laid. Because nests are on the ground, the chicks have developed strong legs and can walk the day they hatch. They can usually fly within 6-8 weeks. This time may be extended if their feeding is reduced by continual disturbance. Young Dotterels wander the coastline for the first 12-18 months of their lives. Most of them breed for the first time at two years of age. New Zealand Dotterel eggs and the chicks are the same colour as the sand around them and are very hard to see. This protects them from bigger birds (such as Black Backed Gulls) that eat eggs and young chicks. But being well-camouflaged also makes it easy for people to accidentally stand on nests or drive over them. Newly-hatched chicks are quickly active. The parents guard them, but they must find all their own food. When danger threatens, the chicks run to the nearest cover and freeze, crouching low and keeping still until the parents sound the ‘all-clear’. Young fly at six to seven weeks. They breed at the age of two or three, and can live to 30 years or older. In late summer, the birds leave their breeding sites and congregate in post-breeding flocks at favoured estuaries for the autumn and early winter. These flocks are socially important; birds which have lost partners during the breeding season can find new ones and young birds pair for the first time. Dotterels have a number of ‘cute’ behaviours, which serve to increase protection eggs and chicks. Parent birds will not go near chicks or eggs while people are around for fear of attracting danger. If however parent birds are away from the nest for a long time, the eggs or chicks can get too cold or too hot and may die. When people are near a nest with eggs or chicks, the parent Dotterels will sometimes call and pretend they have a broken wing to try and lead people away from the nest. Following the adult bird (being careful you don’t tread on eggs or young chicks) is the best thing to do in this situation. The bird will stop calling and pretending it has a broken wing once you are far enough away from its eggs and chicks. When people are near older chicks, parent Dotterels signal their chicks to hide. If people are around all the time, chicks may not spend enough time feeding. This means they grow more slowly. Chicks that grow slowly take longer before they can fly and are more at risk from predators. Some may die. It is for this reason that DOC erects temporary barriers each breeding season. If people (and predators) do not come between nests and the water the chances of breeding success are greatly improved. The greatest threat to Dotterels are predators (rats, hedgehogs, stoats, gulls, hawks, cats, dogs), 4xwheel drive vehicles, wave action during storms or from speeding boats, and picnickers and fishermen too close to nests preventing incubation. For this reason, members of ORRA (particularly over the summer vacation months) assist DOC staff by monitoring the sandspit and dissuading people from entering fenced-off areas. As an Association, ORRA values the rehabilitation and maintenance of a healthy, low-human impact environment in which native flora and fauna can be sustained. Working bees related to pest eradication and planting are usually organised during long weekends. Throughout the year, a vigorous trapping and pest eradication programme is maintained as one stoat can decimate a whole colony of dotterel eggs in a single night. Keep your eyes on the bus shelter and sign the roster during the busy holiday time over Christmas and New Year. Stay away from Dotterel breeding areas and explain to others why they should do so too. Breeding occurs between October and the end of March and the eggs, chicks and fledglings are most vulnerable then. Leave dogs, cats and other pets at home.